Promotional postcard I mailed out in October of 2016. A personal illustration done for promotional purposes. My editorial take on the campaign of Donald Trump. SCBWI Illustration contest: word for that month was bounce. 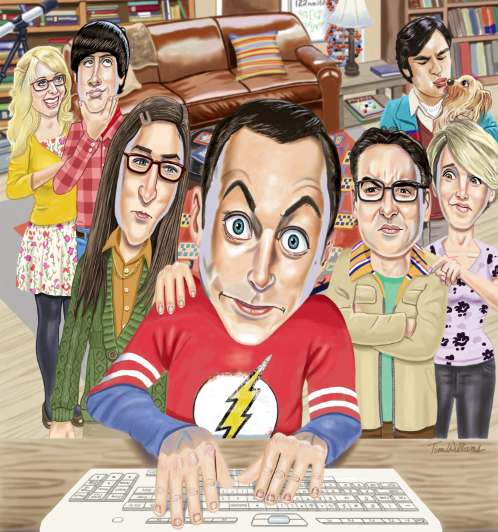 A fun promotional piece I did of the cast from The Big Bang Theory. For the few years it was in print I did most of the art for Y'all magazine. This art went with an article about Southern men's love for their dogs. Another illustration for Y'all magazine. This was about the episode of The Andy Griffith Show that featured Aunt Bea's nasty pickles. This spot illustration was done for Disney Adventures magazine. This is an illustration I just did for fun. This illustration accompanied a Tallahassee magazine writer's article about playing Monopoly with his Lurch-lookalike college roommate. This illustration of Dino, Sammy and Frank was done for a Georgia college who used it for their music department's Rat Pack Night. This illustration accompanied a humor article in Tallahassee magazine. This art won me my second Addy Award. Illustration done for Bethesda magazine. The feelings of a mom giving a birthday party on a miserable and rainy day. This piece about a too-eager customer was done for Bethesda magazine.